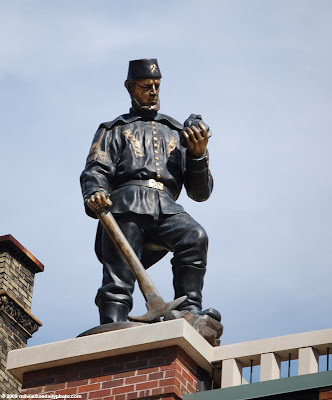 This miner stands atop the Grohmann Museum at the Milwaukee School of Engineering. With 11 other statues, they represent different industries and crafts. The centerpiece of the Grohmann is the Man at Work art collection, and these pieces certainly set the tone. Very appropriate for a school of engineering. What are the other 11 industries? The large-scale bronze sculptures lining the perimeter of the Grohmann Museum’s roof were created from smaller ones that are part of the Man at Work collection: “Iron Miner from the Siegerland, Germany” (pictured here); “Master Forger,” “Foundry Worker With Ladle,” “The Stoker,” “Steel Worker,” “The Old Miner,” “Tanner,” “Railroad Worker,” “Glass Blower,” “Female Mine Worker,” “Field Worker” and second by the name of “Master Forger.” There are also six life-size sculptures in the roof top garden.